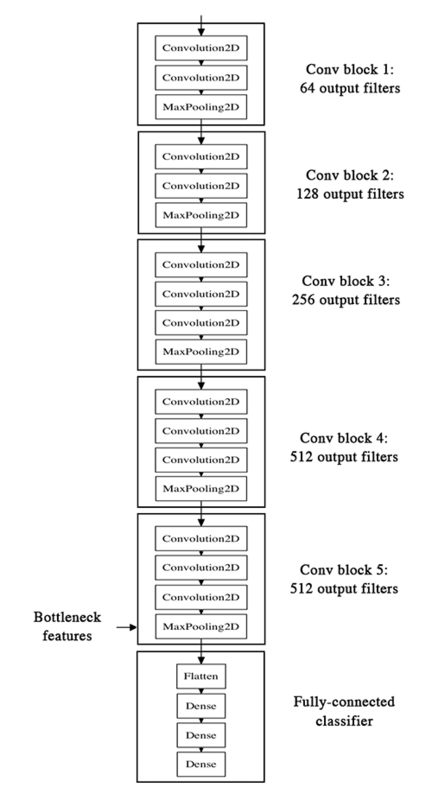 The Keras Blog has an excellent guide on how to build an image classification system for binary classification ('Cats' and 'Dogs' in their example) using bottleneck features. 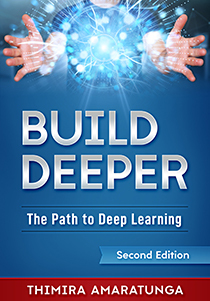 You can find the guide here: Building powerful image classification models using very little data. 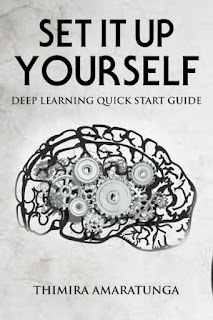 However, the Keras guide doesn't show to use the same technique for multi-class classification, or how to use the finalized model to make predictions. So, here's my tutorial on how to build a multi-class image classifier using bottleneck features in Keras running on TensorFlow, and how to use it to predict classes once trained. In this tutorial, I'm going to build a classifier for 10 different bird images. I only had around 150 images per class, which is nowhere near enough data to train a model from scratch. Make sure all the sub-directories (classes) in the training set are present in the validation set also. And, remember that the names of the sub-directories will be the names of your classes. Save the bottleneck features from the VGG16 model. Train a small network using the saved bottleneck features to classify our classes, and save the model (we call this the 'top model'). Use both the VGG16 model along with the top model to make predictions. We'll be using OpenCV to display the result of a prediction. You can omit it if not needed. Matplotlib is used to graph the model training history, so that we can see how well the model trained. See How to Graph Model Training History in Keras for more details on it. We add a function - save_bottlebeck_features() - to save the bottleneck features from the VGG16 model. We then create the data generator for training images, and run them on the VGG16 model to save the bottleneck features for training. generator.filenames contains all the filenames of the training set. By getting its length, we can get the size of the training set. generator.class_indices is the map/dictionary for the class-names and their indexes. Getting its length gives us the number of classes. There is a small bug in predict_generator, where it can't determine the correct number of iterations when working on batches when the number of training samples isn't divisible by the batch size. 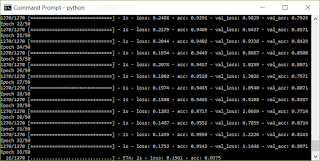 So, we calculate it ourselves with the 'predict_size_train = int(math.ceil(nb_train_samples / batch_size))' line. With the bottleneck features saved, now we're ready to train our top model. We define a function for that also - train_top_model(). In order to train the top model, we need the class labels for each of the training/validation samples. We use a data generator for that also. We also need to convert the labels to categorical vectors. Now create and train a small fully-connected network - the top model - using the bottleneck features as input, with our classes as the classifier output. The training takes about 2 minutes on a GPU. On CPU however, it may take about 30 minutes. I got around ~90% accuracy, and it doesn't looks like the model if overfitting. Which is awesome, since I only had around 150 images per class. How to make a prediction from the trained model? With our classification model trained - from the bottleneck features of a pre-trained model - the next question would be how we can use it. That is, how do we make a prediction using the model we just built? We first run the image through the pre-trained VGG16 model (without the fully-connected layers again) and get the bottleneck predictions. We then run the bottleneck prediction through the trained top model - which we created in the previous step - and get the final classification. Pay close attention to the 'image = image / 255' step. Otherwise, all your predictions will be '0'. Why is this needed? Remember that in our ImageDataGenerator we set rescale=1. / 255, which means all data is re-scaled from a [0 - 255] range to [0 - 1.0]. So, we need to do the same to the image we're trying to predict. The class_indices has the label as the key, and the index as the value. 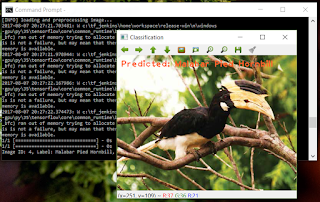 We use OpenCV to show the image, with its predicted class. The complete code for this tutorial can be found here at GitHub. You'll notice that the code isn't the most optimized. We can easily extract some of the repeated code - such as the multiple image data generators - out to some functions. But, I kept them as is since it's easier to walk through the code like that. You can share your thoughts on what's the best way to streamline the code. We didn't cover fine-tuning the model to achieve even higher accuracy. I will cover it in a future tutorial. Very good tutorial. What about doing random transformations in the image generation phase? Yes, adding some random transformations to the training images should improve the accuracy in theory (at least, reduce the chance of overfitting). We can easily enable transformations by adding some data augmentation parameters (shear_range, zoom_range, horizontal_flip) to the ImageDataGenerator used for training dataset. I haven't tested it yet though. I'll try it out and post the results on how data augmentations affect the accuracy. If you get to try it out, let us know the results also. In my case, data augmentation doesn't help. 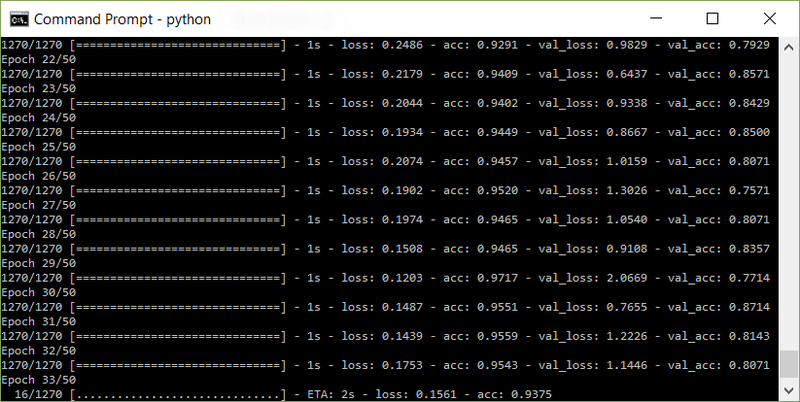 The accuracy goes from 74% to 69% if I apply the augmentation step from keras blog. Don't know why, but it's weird af. Same thing happened with me ! ValueError: could not broadcast input array from shape (16,7,7,512) into shape (13,7,7,512)", any help would be highly appreciated. Thanks in advance. How many training samples do you have? It seems Keras is only finding 13 samples. The code feeds the samples to the predict generator in batches of 16. From the error message it looks like it's unable to find enough samples to fit a single batch. Thanks for the quick reply. For my PoC purposes I'm using cats vs dogs sample with 1000 images in the training set for each class, the output at the begining is as as follows: "Found 2000 images belonging to 2 classes. I guess that should be ok as 2000/2 is 125. By trial and error I have changed the number of images to 2008/2016/2024 and with 2024 it does indeed work although I have no idea why, now the problem is with validation set prediction and the same error (could not broadcast input array from shape (16,7,7,512) into shape (2,7,7,512)). I have 400 images for each class (800 all together). Do you know how to calculate the proper number of train/test images? Ok, I've found that the issue is caused by the older version of Keras (1.2.2). With 2.0 all looks good so far. Thanks again for your help. Glad you were able to find a solution. I'll add a note to the article to verify the Keras version. Intel 2.7 GHz with 8GB. I took the training data and run it on the VGG16 model to save the bottleneck features. It seem to take forever. how much time it should take? what am i doing wrong? These models does take time to train. With the dataset I took for this example - around 2000 images - it takes more than an hour if I train it on CPU. When trained on a GPU (via NVIDIA CUDA) the training completes in around 15 minutes. A larger dataset would take even more time. It is quite normal for models like these to take a lot of time to train. The same has to be done for the validation bottlenecks respectively. The resulting bottleneck files are huge! In my case they are bigger than the total size of all training images. Is it possible that this method stores the whole weights and not just the top layer? Or do you have any clue what the reason might be. Thanks! Ah, I'll put a note about the integer division problem. Thanks! The bottleneck features are not the weights. 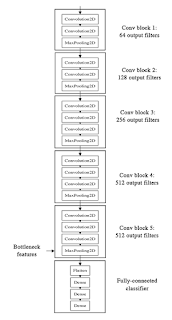 They are the activation maps of each input from the final convolution layer of the network. So, they are basically (num_training_samples * size_of_activation_map). So, depending on the dataset, there is a chance that the bottleneck features are larger than the dataset file size. Tats a great post :) do you mind coming up with a post on solving multiclass multi-label classification problems (single image having multiple labels) with Keras? Or do you know any good resource that could help me find such codes? Looking forward. Why are you building your model again when predicting from a model that has already been trained? In other words, you have computed bottleneck features, built a model to use those features and trained it. Shouldn't your prediction on new image just be the following steps? (i) compute bottleneck features for a new image (ii) use weights from trained model and predict classification. Why do you have to build a model again during the prediction step? ValueError: Dimension 0 in both shapes must be equal, but are 25088 and 8192 for 'Assign_52' (op: 'Assign') with input shapes: [25088,256], [8192,256]. sir, i am having this error whar should i do ? Hi, I am encountering the same problem. Did you have any luck fixing it?? sir why should i get loss = none ? any reason ? Since the code is aiming to do multi-class classification, shouldn't the last layer activation be softmax instead of sigmoid? Yes, we can use softmax instead of sigmoid. changing the class_mode to categorical appears the following error Input arrays should have the same number of samples as the target arrays. Found 1776 input samples and 1778 target samples. Hello, I'm trying to run the code in a problem containing 12 classes, 1778 images for training and 621 for validation. Can you help me, what am I doing wrong? Hi, I am having some issues on predicting, I cant seem to load the weights that I obtained from training the model. I am getting ValueError: Dimension 0 must be equal. Which data set is used here? It was one of my own datasets: some images from my own photography merged with images found from few other sources. C:\Program Files (x86)\Python35\lib\site-packages\h5py\__init__.py:36: FutureWarning: Conversion of the second argument of issubdtype from `float` to `np.floating` is deprecated. In future, it will be treated as `np.float64 == np.dtype(float).type`. Found 24635 images belonging to 12 classes. Thanks a lot! This has been really useful. Awesome tutorial! I used it on my own image classification for 4 different species and it worked well! Have you had a chance to do a tutorial on refining the model for higher accuracy? I checked the articles but wasn't able to find it. I would love to see it, if so! Thanks! Hi quick question. You are using the term validation for some dataset, but in some of the pictures you refer to them as a test dataset. Have you used a validation set in this tutorial as an test dataset. Or was it also used to tune some parameters? Thanks for the great tutorial btw! Hi Thimira, have you been using the dataset as a validation set or test dataset. Because in the plots you refer to the validation set as a test dataset. Does that mean you have not used the validation set to tune your model and was it purely testing? Looks like I haven't been consistent with what I referred as validation set. Let me fix that. You should be able to simple replace VGG16 with InceptionResNetV2. Are you getting any errors? I am getting an error - StopIteration: cannot identify image file '/Users/Anuj/Desktop/Python codes/Dataset_faces/training_set\\Ananth\\00000.png' in the predict function. The training part has been completed. Any suggestions as to why this is happening? Looks like an image format error. Do you have the 'pillow' package installed? Thanks for the great tutorial , but how could i plot the confusion matrix for the data ?